When building a lot of soa suite composites, your environments end up with many different versions. So we might end up with 3 LocationService composites with versions[1.0.0.0], [1.0.1.0] and [1.0.2.0] which is the default. This takes up resources and clutters the EM. So you might want to have a way to remove these easily with having to go to the EM and manually uninstalling all of them with the risk of mis-clicking. 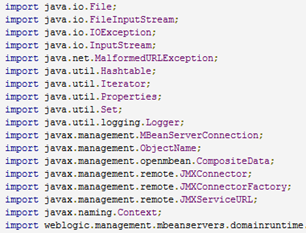 In this blog I will show an easy way to undeploy old soa composites using java. At first I looked at WLST and there is a sca_undeployComposite but we don’t want to specify each composite seperate. We just want to look through al composites and see which ones aren’t default and then undeploy them. There is also a sca_listDeployedComposites but I couldn’t find a way to pipe the output of this to an array to be able to work with it. So I just did what I know best and write it in Java. It basically does the same. Just connect through JMX, look up all the composites and check if they are: Read the complete article here.